At the beginning, a crossing of two cultures, French and Japanese, which is going to awaken many things in each one of the authors who participates in this adventure: a stay in Japan does not leave one indifferent... Eight stories from nine European authors result, in which all the exoticism of this elusive and mysterious country is depicted with imagination, humor and poetry. As if in response to these impressions of the artist-travelers, eight authors from the Archipelago portray their own Japan, the everyday one, that of modernity and that of legend. After reading this sentient collection of anecdotes and tales woven together from such different views, one desires nothing more than to visit and see for oneself some bit of the land of the Rising Sun. Japon was a project carried out by the French Institutes and Alliances in Japan. Seventeen authors, nine French authors and eight from Japan, were commissioned to create a short story based on a city in Japan where the institutes are situated. While the Japanese authors created stories based on where they live or their hometowns, the French authors were invited to different cities in Japan for two weeks. 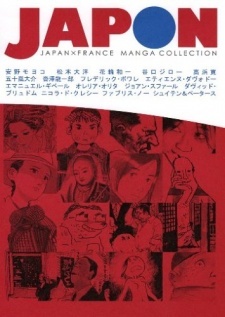 It was published in French on November 8, 2005 by Casterman, and later in Japan on December 20, 2005 by Asukashinsha. It was also published in English by Ponent Mon/Fanfare on September 28, 2007, in Dutch by Casterman, in Italian by Coconino Press, in Polish by Hanami and in Spanish by Ponent Mon. Japan as Viewed by 17 Creators is an internationally-published anthology that features the work of seventeen artists - nine from France and French-speaking countries, and eight from Japan. I'm not as well-versed in French comics as I am in manga, so I am not familiar with any of the European creators, but among the Japanese contributors there are names that may be familiar to manga connoisseurs: Matsumoto Taiyou (Ping Pong, Tekkon Kinkreet), Taniguchi Jiro (Aruku Hito), Anno Moyoco (Hataraki Man), and more. This is an anthology, and like all anthologies it's difficult to rate as a whole - there are always going to be some pieces in the collection you like more than others, and it's unlikely that every single story will appeal to you. The art is a mixed bag, drastically different for each artist - the art runs the gamut from the detailed styles of Taniguchi Jiro's "Summer Sky" and Fabrice Neaud's "City of Trees" to the cartoonish sketches of Aurelia Aurita's "Now I can die!". Some of the stories, like Emmanuel Guibert's "Shin.Ichi" aren't even comics at all, but narratives with accompanying illustrations. The Japanese authors, on the other hand, wrote from insider points of view: Igarashi Daisuke's "The Festival of the Bell Horses" and Matsumoto Taiyou's "Kankichi" are fantasy stories steeped in Japanese folklore, and Taniguchi's "Summer Sky" is a straighforward and very Japanese tale of unrequited love. Overall, I have awarded this anthology a 9 based on the stronger stories in the collection. Graded individually, the scores go as low as 4 and as high as 9. Most of the stories in the anthology are good - there are far more good ones than bad/middling ones-- and they are good enough to justify the existence of this anthology.